I really wanted to enjoy this, I really thought I’d enjoy this. Spoiler for you, I didn’t. There is no denying that Atwood can write, technically this book is brilliant. The prose is – on the whole – incredible but for me, this 600+ page beast was just a disappointment. The characters, the plot, the whole novel-within-the-novel-within-the-novel situation – it was tedious and exhausting. By the time I reached the final 100-150 pages, I had long since lost interest. By that point I was honestly just trying to plod through and finish the damn thing. The main character, Iris Chase, may be the weakest, most unlikable female character I have ever had the misfortune to read from the perspective of. I had absolutely no connection to her which made this book even more of a challenge. The story of Iris’ life was just so unbelievable that the plot just didn’t grip me, it had me snorting in disbelief instead. Everyone around her dies and it doesn’t feel believable, it feels like everyone dying is just a convenient plot twist in order for the author to write this exact book. As I said, this book is a story-within-a-story-within-a-story. It was too many layers not executed to their best I feel. Technically, it was very impressive but as a reader it was just too convoluted. Come the end of the story, I was bored with all the layers to this book. I happened to think this structure was overkill, and I wasn’t compelled by anyone or anything. For me, I’d have preferred to have had the book be 200 pages fewer and one less layer to the narrative (because the complexity was, for me, surplus). However much I disliked it, the prose was – in places – undeniably beautiful and for that, Atwood will never get less than a 2* review from me. But, out of all the Atwood I’ve read, this is by far my least favourite. I know that’s like blasphemy, it’s a Booker Prize winner, it’s probably one of her more critically acclaimed books but for me, it just fell flat. If you want good Atwood, I’d recommend The Handmaids Tale or Oryx and Crake/Year of the Flood – they surpass this monumentally in my opinion. 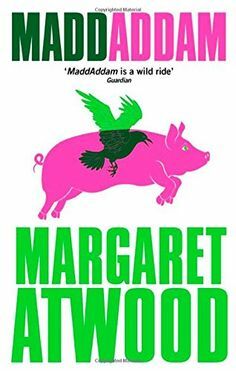 MaddAddam has been a book that I’ve put off for a while as I haven’t quite felt ready to end the trilogy. I found Oryx & Crake okay, I absolutely adored The Year of the Flood but this, I actually found this a little disappointing as the conclusion to the trilogy. After finishing The Year of the Flood I was pretty excited to get started on this. The prior two books had converged neatly at a point – they were told from two perspectives about the same events and because of this I was very much expecting this to go full steam ahead in to the future and conclude in some epic ending and it just didn’t. It was mostly flashbacks, which while interesting made the book feel painfully slow. Zeb is interesting and finding out how he got to the point he is at in this book was great but I wanted to go in to the future, not go further back! Jimmy spends most of this book in a coma, the women from the second book are mostly ignored. Toby gets some ‘screentime’ but not nearly what I feel enough and… I just felt disappointed. The main issue for me is I don’t think this was what I was expecting. It was like walking through treacle, in all honesty. What I found most disappointing what it went from two books with genetically engineered dystopian futures to, well, what I felt was a joke. Nothing about this was believable an it felt as if it were a parody of the two previous books. It just paled in comparison. It doesn’t change my opinion on either of the former, The Year of the Flood remains one of the best books I’ve read this year but I can’t say I would recommend reading this. It wasn’t the satisfying ending I had hoped for and yes, it was perfectly readable but it just wasn’t anywhere near as good as Oryx & Crake or The Year of the Flood. Because of this, MaddAddam gets a 3* review from me with the advice that you should only read this as a completionist and not with any expectations for it to meet. I wish I had stopped at The Year of the Flood. It was good, but it was a let down from the previous two. Holy mother. I hate to post reviews on top of each other like this – within 24 hours of each other – but this book. THIS BOOK. I just had to. I’m sorry! I loved this so much more than Oryx and Crake. I read the first in this series in December and, while I enjoyed it, I struggled to get through it at times. This I was sucked in from the outset as, while Oryx wasn’t at the forefront of my mind as I initially went in to it, it made me love the first part of this trilogy more in hindsight. It’s not really a sequel, more of the same event from a different perspective that fills in some of the blanks and I really appreciated that! The Year of the Flood is more about the ‘everyday’ life in the future that Atwood has created. We follow two women; Toby and Ren. We get their stories, both before and after “The Flood”. We explore the cultish movement of “The Gardeners” and how they met as characters, how they developed over the years with The Gardeners. I found this absolutely fascinating, I can’t lie. I loved the exploration of what is essentially a religion based around both Christianity and Veganism at extremes – it was so interesting! Atwood shaped characters so wonderfully in this book. I’d happily read a book from any of the perspectives of the main body of characters we are introduced to over the course of this novel. Pilar, the beekeeper was the character I really wanted to know more about and didn’t quite get enough of and I’d have loved to have read from her point of view because I think she had a very interesting story to tell! The characters in this were what made me love it all the more, I found them so much more readable than those in Oryx and Crake. A lot of people said this was a step down from Oryx and Crake but I disagree. I found this more compelling to read and, also, I found that it made Oryx and Crake more enjoyable in hindsight having had some additional information from this. Though this could be read as a standalone, reading it after Oryx and Crake will probably mean you get the most out of it as a reader. I’m apparently having a very good month because I’m giving this a 5/5 too. Damn I can’t wait to read MaddAddam! This book was a weird one for me. I really enjoyed it but I found it a real hard going read. A lot of people who I trust for reviews and good book recommendations said that this was a really quick read, and maybe I’m just really ‘zoned out’ right now due to one thing and another, but I just really didn’t find that. It’s of the speculative fiction genre; it’s a book that explores what could happen in the future. It is somewhat SciFi/Dystopia but it really isn’t. It’s very extreme but I think that’s the point. What I think scares me most isn’t the eugenics and gene splicing etc but the simple fact that gated communities actually exist. To me, there is nothing less desirable than having to live in this ‘perfect word’ as Atwood described them. I know that the person I am is down to how and where I grew up, going to a school in a ‘deprived’ area and growing up relatively unsheltered. These things really shaped the adult I’ve become and knowing that gated communities are out there, however far from the construct Atwood created, is a scary thought. Science – genetics – has it’s place in the world, there are so many wonderful things that can be accomplished by science but the thought of isolation is terrifying! Ultimately, I am very mixed about this book. Some parts of it were just mindblowing, others were just meh. I feel in a minority because it seems everyone I know who has read this book just loves it. I wasn’t all that invested in Snowman at the beginning, Jimmy I was however interested in. I was tempted in parts to skip over Snowman and head straight back to Jimmy because it was just more tangible and relatable even though it was a little extreme. And while I did enjoy it, I didn’t enjoy it in the way I usually enjoy a book. It definitely made me think. The characters in this were a little lacking in parts for me. I think that was intentional, truthfully, you’re supposed to be left hanging really. Oryx especially was vague, I wondered in parts if she was real or just simply a figment of Jimmy/Snowman’s imagination. She seemed ethereal, surreal, sometimes she was fleshed out and other times she was just ghost like. She was the only real connection to the ‘outside’ world, however harrowing her past actually was. She just seemed to be the female influence whenever Jimmy/Snowman needed one, she was exactly the woman he needed at each pivotal point. Crake was just power crazed, wanting to save the world but ending up as the hands of destruction. And Jimmy, as for our main protagonist, I found him pretty dull as Snowman, but found the story as Jimmy quite engaging. If the story was narrated in a less disjointed manner, I think I would have preferred it – but the whole point of it is to be disjointed and a bit higgledy-piggledy. I preferred The Handmaid’s Tale in terms of writing. There are a significant number of parallels to it, they were on the whole very similar but I think the faint glimmer of hope at the end of The Handmaid’s Tale just elevated it marginally in my estimations. I’m quite interested to read the other two books in the series just because it was a really deep, compelling ‘world’ to read about. Ultimately I’d give this 4/5 stars, I think though this may change with time. I have a feeling it’ll be one of those books that stays quite firmly in my mind for a long time.